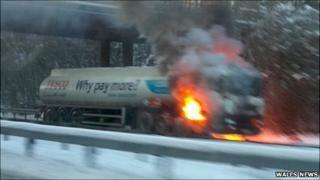 A main road in Cardiff has reopened after being closed by a fuel tanker fire on Sunday. The blaze around 1545 GMT on the A48(M) between the St Mellons turn-off and junction 29 with the M4 sparked a major response by firefighters. The tanker contained approximately 39,000 litres of diesel and petrol and the fire destroyed the cab although the driver escaped unhurt. Around 70 firefighters from 14 fire stations tackled the blaze. The South Wales Fire and Rescue Service said their actions "undoubtedly avoided" what could have been "a catastrophic situation." Incident commander Peter Jenkins said: "On arrival, crews were faced with a severe fire involving the driver's cab and the front tyres of the vehicle. "Due to the severity of the fire, the front section of the fuel tanker became involved, and approximately 1,000 litres of diesel was ignited. "If the fire had been able to spread to the remainder of the tanker, then there would have been a very real risk of a massive explosion. "Crews worked very hard in sub-zero temperatures to bring the fire under control, and a potential major incident was averted. "I would like to personally thank all those involved in the operation, which was carried out in extremely difficult conditions due to the ice, snow and freezing temperatures."